Alexander Sergeyevich Dargomyzhsky (Russian: Алекса́ндр Серге́евич Даргомы́жский) (14 February [O.S. 2 February] 1813 – 17 January [O.S. 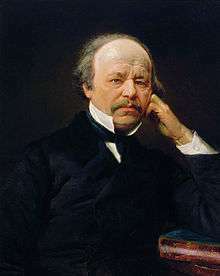 5 January] 1869) was a 19th-century Russian composer. He bridged the gap in Russian opera composition between Mikhail Glinka and the later generation of The Five and Pyotr Ilyich Tchaikovsky. 1 2 3 Chisholm, Hugh, ed. (1911). "Dargomijsky, Alexander Sergeivich". Encyclopædia Britannica. 7 (11th ed.). Cambridge University Press. p. 832.